In the latest company rankings, Brand Finance has detailed the 500 Most Valuable Brands in the United States for 2018 [PDF], with Apple earning 2nd place this year and not moving spots from last year. 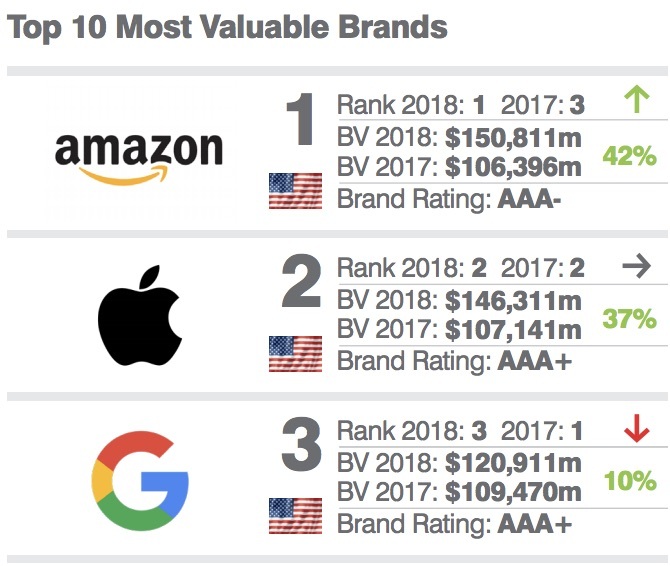 A lot has shifted around the company, however, with Google dropping from 1st place last year to 3rd place this year, and Amazon rising from 3rd to become Brand Finance's #1 most valuable U.S. brand in 2018 (via Business Insider). According to the methodology, Brand Finance evaluates which brands "are the strongest and most valuable across all markets." This includes an "Enterprise Value," "Branded Business Value," "Brand Contribution," and "Brand Value." The researchers then combine this with a "Brand Strength" index, which calculates a score out of 100 based on three factors: marketing investment, stakeholder equity, and business performance. Overall, the researchers found that 2018's results prove companies in the technology sector "have cemented their position as absolute leaders in the market." 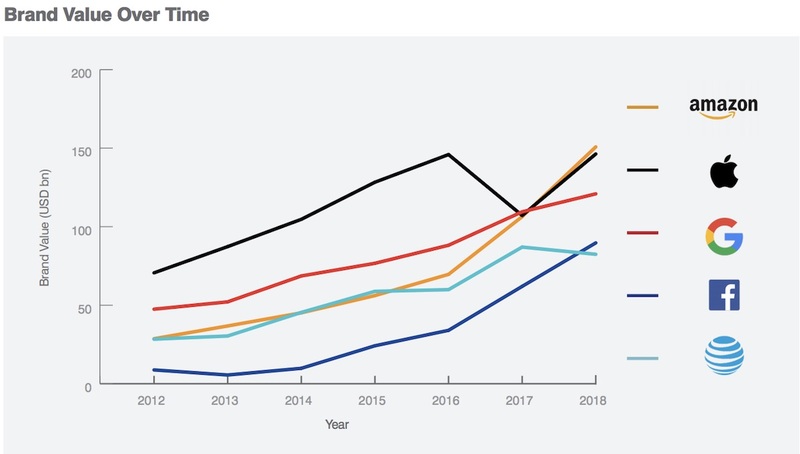 In first, Amazon grew its brand value 42 percent this year to $150.8 billion, overtaking Apple's stationary spot in second place. Although the company didn't move, it did grow its brand value 37 percent to $146.3 million. Google grew its brand value 10 percent to $120.9 million, but was still "unable to keep pace with the remarkable growth of the top two brands." Rounding out the top 10 were Facebook in 4th (45 percent brand value growth), AT&T in 5th (5 percent brand value drop), Microsoft in 6th (6 percent growth), Verizon in 7th (5 percent drop), Walmart in 8th (1 percent drop), Wells Fargo in 9th (6 percent growth), and Chase in 10th (15 percent growth). It's important to note that Brand Finance's rankings don't directly measure each brand's actual revenue or profit from a given year, but focuses instead on its own specialized system to discover a brand's value. Specifically, Brand Finance CEO David Haigh said the corporate brand valuations are compliant with the International Organization for Standardization's 10668 and 20671 specifications. In other recent rankings, Apple dropped to the 4th spot in Fortune 500's annual list of the top U.S. corporations based on gross revenue. Earlier in the year, the company earned the top spot as the most intimate brand in the U.S for millennials in a list that measured which brands had the deepest emotional connections with respondents. Wow, I guess all the Russia and privacy stuff are not affecting Facebook's brand at all. Exactly. Just goes to show just how little people care about privacy and such. People just want a service to use, they don't really care otherwise. Apple are at No.2? Those watch bands must be more popular than I thought. Going to use them to get a newer MacBook Pro in a few weeks. This is so true. Even with increased cost of Amazon prime, I don’t even utilize the other music/movie services, I want the guaranteed two day shipping to my door. Why? Because we now live in this world where we want everything faster and quicker for things we order online, which seemingly can take longer from other online sites. Amazon sometimes depending on the circumstance, I can even have the item delivered under two days depending where the item is shipped from. You can’t beat the two day Prime delivery considering what it would cost someone frequently ordering two day delivery *without* the Prime Service. Prime pays for itself, especially for the convenience factor of when I know the time will be delivered to my door.